Through our work with more than 1,700 clients in 23 countries, we’ve built a deep understanding of company culture, employee engagement and the tools, techniques and best practice that companies use to build connections with their people. We’ve codified this understanding into a 10-element employee engagement model, the Engagement Bridge™ which documents the key parts of your organisation and your relationship with your people that you need to consider in order to build a more engaged culture. The order that you should approach things and the importance or value that each element has will depend on your own context – where you are in your employee engagement strategy, the makeup of your workforce and the type of market you are in. 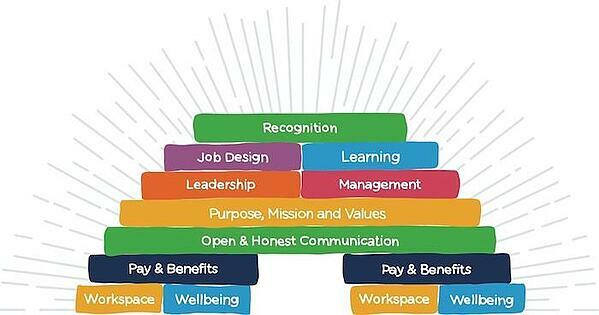 As our Global Director of Implementation and Support has said, employee engagement is not one-size-fits-all. Remember, we're always here to help you take a hard look at your employee engagement strategy and hone in on how you can build your own bridge. Get started by reaching out to one of my colleagues below. This is the foundation of the Engagement Bridge™ — creating an open and honest culture is incredibly important. What we mean by this is building an open and transparent communications culture, so your people understand the “why” behind your decisions, you’ve created two-way feedback routes and you’ve fostered an environment where your people trust your decision and your leadership. Are you giving your employees something bigger to work towards, and do they understand your organisation’s contribution to both your industry and society? When I say Reward Gateway’s mission is, “Let’s make the world a better place to work,” I want our employees to understand that our offering — HR technology — is a means to better connect the organisation to their people, in a variety of ways to build better engagement. Your purpose, mission and values are your guiding light … they help with strategy, decision-making and employee behaviors to lead the company to greater success. Leadership is what the company says it will do, while management is what the company actually does. These are the underpinning elements in the Bridge™ — the absence of these can cause your bridge to collapse, or prevent you from forming a bridge at all. Pay and employee perks are a necessity in any job, and are important supporting elements of the Bridge™. Likewise, the care you put into your workplace and your employees’ wellbeing can drive productivity levels, define some of your company culture and bring your company values to life. When it comes to the Bridge™, there’s no fixed starting point. The most important thing you can do as a leader is to take action. Today. Right now. So start where you can make the biggest impact the fastest. And lastly, know that engagement is never “done.” There’s no such thing a “perfect” engagement — it’s a work in progress, and it changes as your business and your people change, too. 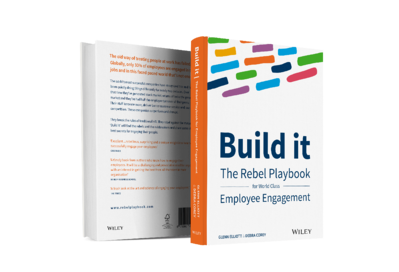 To read more about all 10 elements of our employee engagement model, the Engagement Bridge™, and hear from companies on how they've used the power of their people to increase profitability and create top-notch company culture, order Build It, The Rebel Playbook for World Class Employee Engagement, now on shelves.